Staying connected is critical when you're on the move. 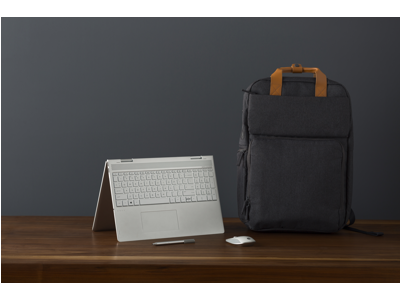 This backpack's built-in 22,400 mAh battery powers up your laptop, smartphone or tablet, so you can remain productive while you work remotely or rush between classes. Zippered computer compartment fits most laptops with a display up to 17.3". Padded shoulder straps help you carry your gear comfortably. Sturdy grab handles at the top let you quickly pick up the bag. Main compartment and multiple accessory pockets provide ample room to organize your belongings. Built-in HP Power Pack Plus 22,400 mAh battery inside the front pocket provides on-the-go refueling power. Recharges most HP laptops with up to a 17.3" display, as well as a variety of USB-enabled devices, including tablets, GPS units, gaming devices, wireless headsets and more (additional cables may be required, sold separately). Sequential charging technology lets you control which devices charge first and fully charge your laptop once, your tablet up to 3 times and your smartphone up to 10 times. Battery life will vary depending on the product configuration, product model, applications loaded on the product, power management setting of the product, and the product features used by the customer. As with all batteries, the maximum capacity of this battery will decrease with time and usage. Includes 2 USB-to-micro-USB cables, a 19V 3.5 mm barrel-to-4.5 mm barrel cable, a 19V 4.5 mm-to-7.4 mm adapter, a 19V 7.4 mm-to-4.5 mm adapter and a quick-start guide. With power priority, you control the order in which your devices charge. A built-in heat sensor monitors backpack temperature and adjusts accordingly. Meets security requirements for in-flight carry-ons. Easily access and use your phone while it’s charging. Two USB micro cables for Android® devices and one laptop cable included. HP includes a one-year limited warranty with online support available. Consult the HP Customer Support Center for details, or go to www.hp.com/go/orderdocuments. Internet access required and not included. PamSK2: I absolutely love this backpack. It is so light, and holds everything I need to use. kayleetooncesdot: This didn't include a rain cover like it said it did in the insert that came with the backpack. I've charged it, but haven't tried using it yet. Not happy about not everything being included when this is a pricy item. Also, it doesn't include a charger for the battery to the wall. You have to use your HP computer charger. 1 Charging time will vary depending on the charge level of the device being charged. The maximum capacity of the battery will naturally decrease with time and usage. Device stores 84 Wh of energy equivalent to 22400 mAh. Does not support devices that charge with a USB-C connector or proprietary charging methods. Supports HP laptops that use 4.5mm or 7.4mm barrel connectors.